Welcome to God’s Own Country! Following your arrival at the Cochin International Airport, you will be warmly greeted by our tour guides and representatives. Post this, you will be driven towards Munnar or the ‘Nature Lover’s Paradise’. Arriving in Munnar, check-in into a hotel or a resort and unwind yourself for a leisure day followed by overnight stay at the hotel/resort. Brace the playful morning light and wake up to a beautiful morning at the hotel/resort; get freshened up and enjoy a healthy breakfast. Post this, you will be guided for a full day sightseeing tour wherein you will be visiting the important landmarks and other important places in Munnar..
Mattuppetty, Echo Point, Gundala Lake, Photo Point, Elephant Arrival Spot Cinema Shooting, and several other places. During the day, you will also visit Eravikulam National Park where you can enjoy spotting the exotic Nilgiri Tahr and several other wildlife species. Post this, a visit to Anaimudi Peak; the highest peak in South India, along with Tata Tea Museum, International Blossom(Hydel) Park, spice plantations and other places will be visited during the day overnight stay will be in Munnar..
Today morning; following your breakfast at the Munnar hotel/resort, pack your bags and check-out from the hotel/resort. Hereafter, you will be driven towards the gorgeous Thekkady town, where you can indulge in an array of activities for the rest of the day. Following your arrival in the town, settle down in a hotel/resort and relax for a while. Post this, embark on a rustic tour to one of the tribal hamlets in Thekkady followed by a plantation tour. Embrace the enchanting beauty of God’s Own Country, and take an evening boat ride to national park. Coming back from the boat ride, you can go for local shopping and enjoy the local flavours of Thekkady; overnight stay in the hotel/resort. After breakfast is served at the Thekkady hotel/resort, you will be checked-out and driven towards Alleppey, the ‘Backwater Capital’ of Kerala. Also known as the ‘Venice of the East’, this backwater abode is a true treasure trove for the nature lovers, honeymooners, leisure seekers and other classes of visitors as well. Arriving in Alleppey, check-in into a houseboat and enjoy manoeuvring the silent yet alluring backwaters. 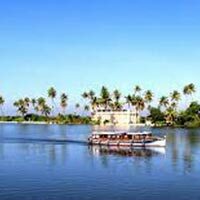 Delight in the facilities and amenities within the boat and pass through the lush coconut lagoons, never-ending paddy fields, narrow canals and coir villages; overnight stay in the houseboat. Waking up today morning, pack your bags and check-out from the houseboat. Wish adieu to Alleppey and take your final drive to Cochin; with your arrival in Cochin, this exciting tour will come to an end!